Mbas974 wrote: Hi all, I'm very happy with my pedal I built some time ago, everything is working well. One question related to this circuit but O.T. Will it be possible tweak the circuit in order to not have the envelop ? Let me explain... this pedal is extremely silent that only when I play sound come out... in other words it is a GREAT GATE pedal. So I was wondering whether I can mod it to change it in a standard GATE without the envelop. it has low noise prolly due to two things - low gain to not make self-noise or increase any incoming noise and a filter to cut out any high frequency noise. also, the filter is at its lowest position with no input signal which is what you want for a noise gate. if you wanted to make it into more of a gate you would want the filter to be a lowpass (see my lowpass mod) and instead of using an envelope derived from the input signal level, use a square wave instead, e.g. as long as you have signal the filter is at max position. I've just been given a DOD FX25 pedal from a friend who got in a pickle trying to fix a broken wire and ended up doing a really bad job of rewiring it. I don't understand wiring schematics so I wondered if anyone had any pictures of the guts of this that they could share so I could trace where each wire should be? I got again after ages a DOD FX25B, and I did few mods to it. - C11 up to 22uF to have a better, not so quick decay. - changed R5 from 20K to 10k, this solves the volume drop and gives the filter the bite many says is missing in the FX25B. - since this filter is very similar to the Korg MS20 VCF, I added a switch to select betwenn the DOD envelope, or flipped it becames a fixed filter with the additional pot to set the cut frequency. I built the circuit of the DOD FX25 on veroboard sometime ago, but I got a sort of huge boost of the bass just in the tail of the decay, making my amp vibrate! Then I completed the Snow White, veroboard. It's nice, but I guess the decay pot doesn't do anything. 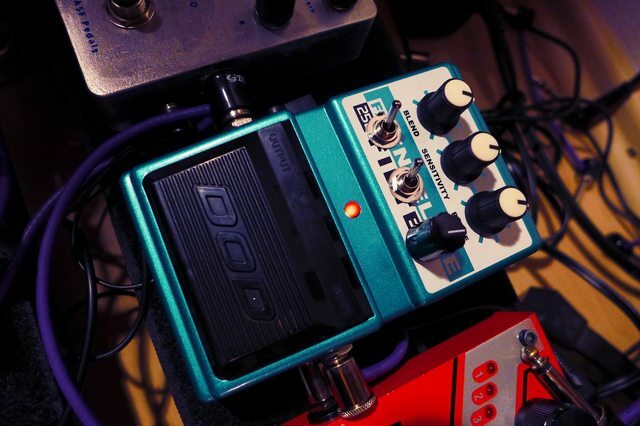 Ichabod_Crane wrote: I built the circuit of the DOD FX25 on veroboard sometime ago, but I got a sort of huge boost of the bass just in the tail of the decay, making my amp vibrate!